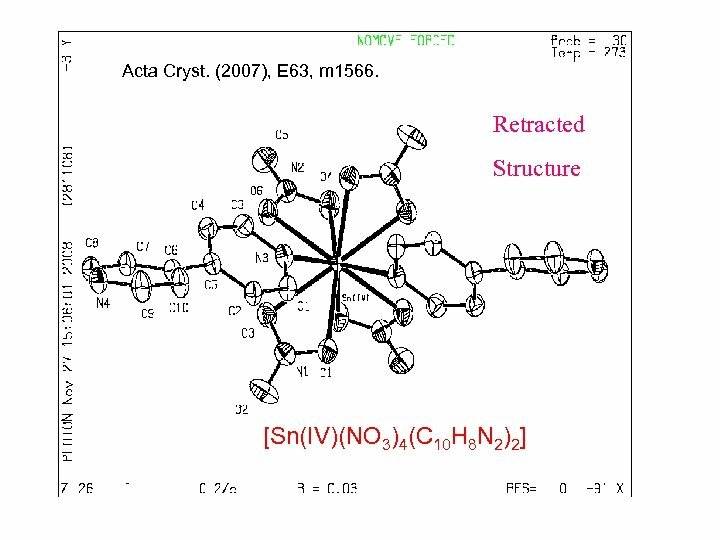 Why Small Molecule Crystal Structure Validation ? 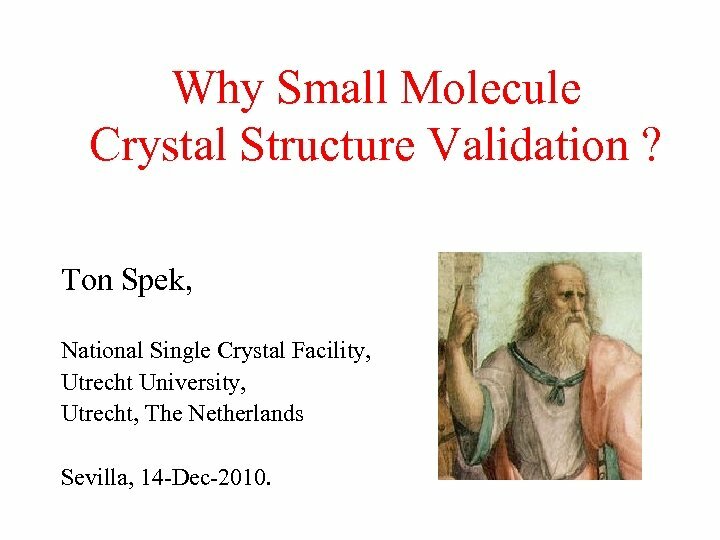 Ton Spek, National Single Crystal Facility, Utrecht University, Utrecht, The Netherlands Sevilla, 14 -Dec-2010. 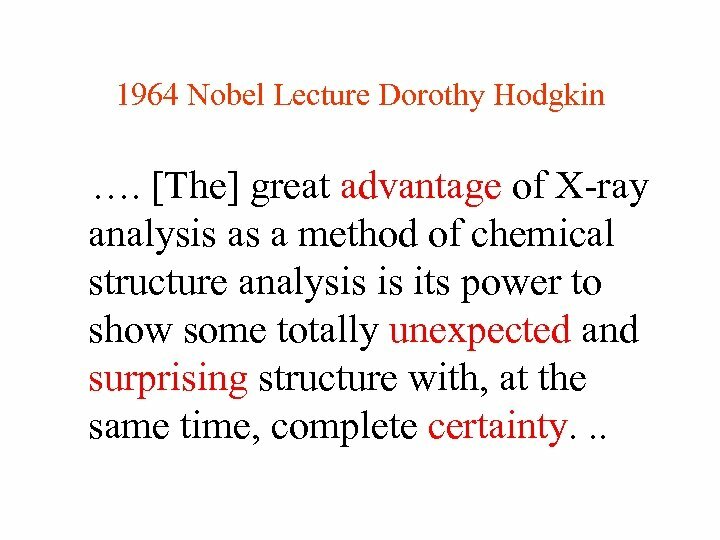 1964 Nobel Lecture Dorothy Hodgkin …. 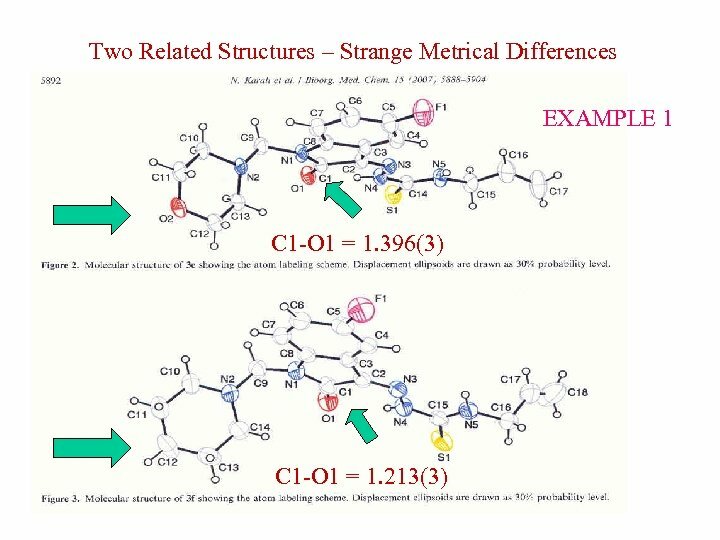 [The] great advantage of X-ray analysis as a method of chemical structure analysis is its power to show some totally unexpected and surprising structure with, at the same time, complete certainty. . .
With “Complete Certainty” ? Yes, in most cases, in particular in the hands of experienced investigators. No, when proper scientific procedures have been ignored. This presentation will address a number of obvious cases where proper procedures were ignored, resulting in erroneous science. 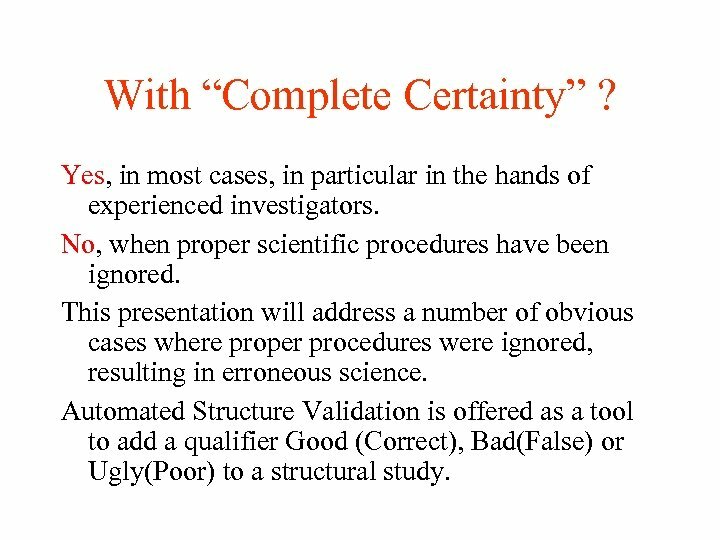 Automated Structure Validation is offered as a tool to add a qualifier Good (Correct), Bad(False) or Ugly(Poor) to a structural study. 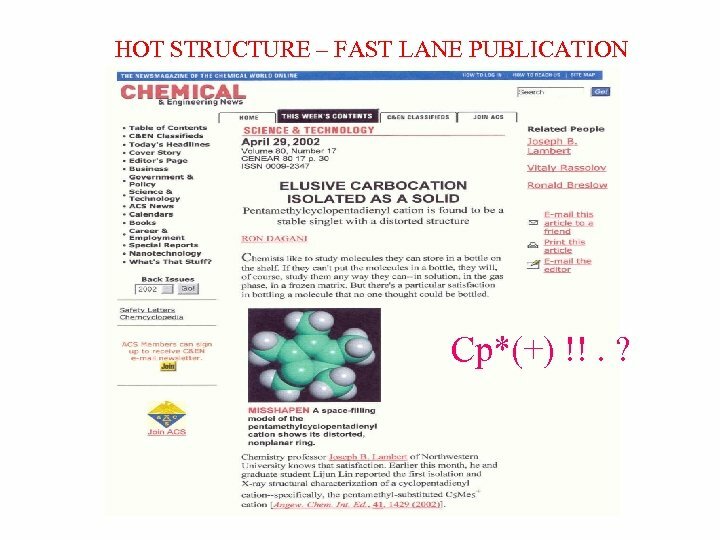 HOT STRUCTURE – FAST LANE PUBLICATION Cp*(+) !!. ? 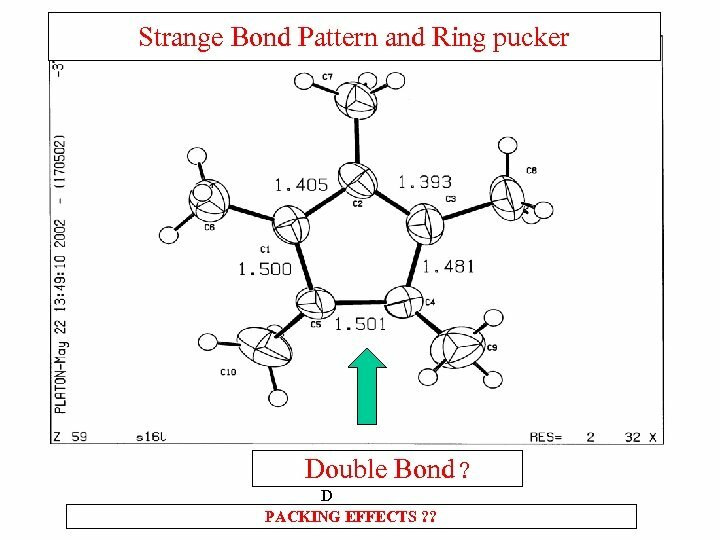 Strange Bond Pattern and Ring pucker D o D PACKING EFFECTS ? ? 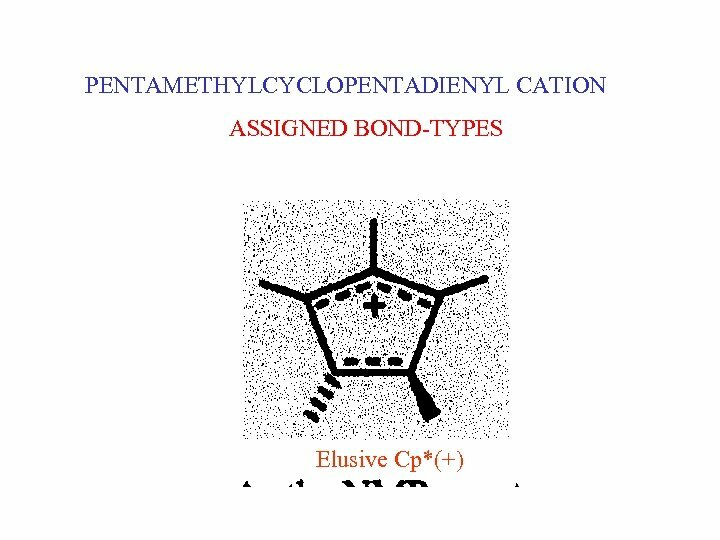 Double Bond ? Where did it go Wrong ? 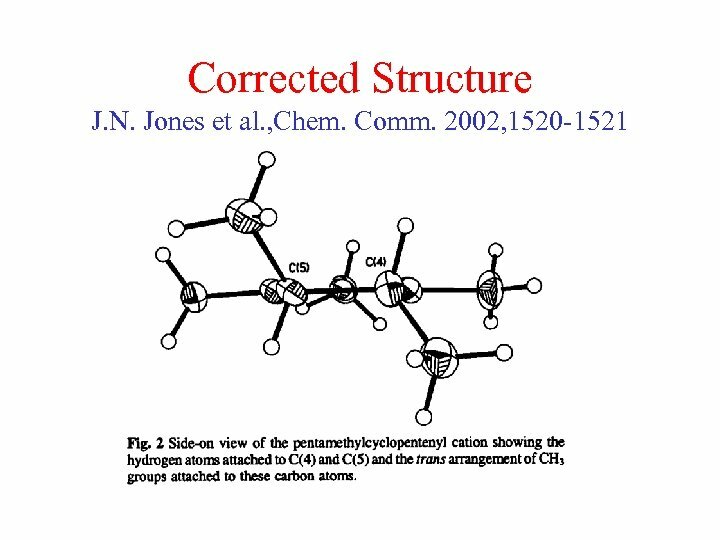 First impression/interpretation of the structure was likely based on a preliminary result (plot) without H-atoms. 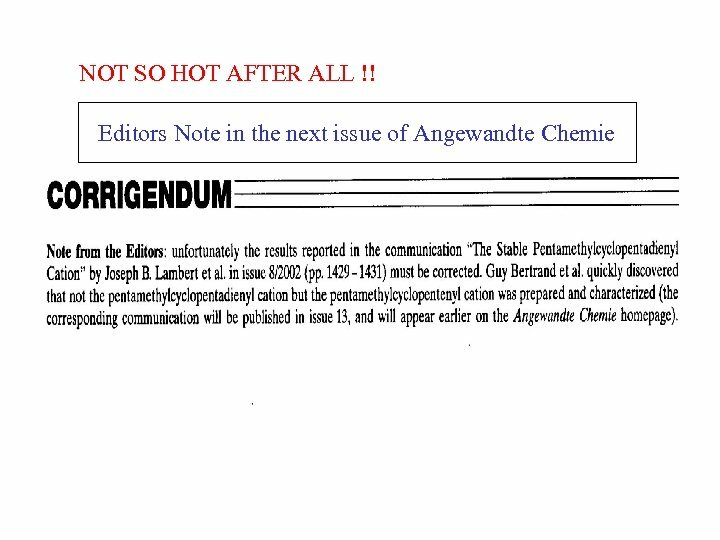 Rushed as a short communication into the prestigious high impact journal Angewandte Chemie. Ignoring all counter evidence. 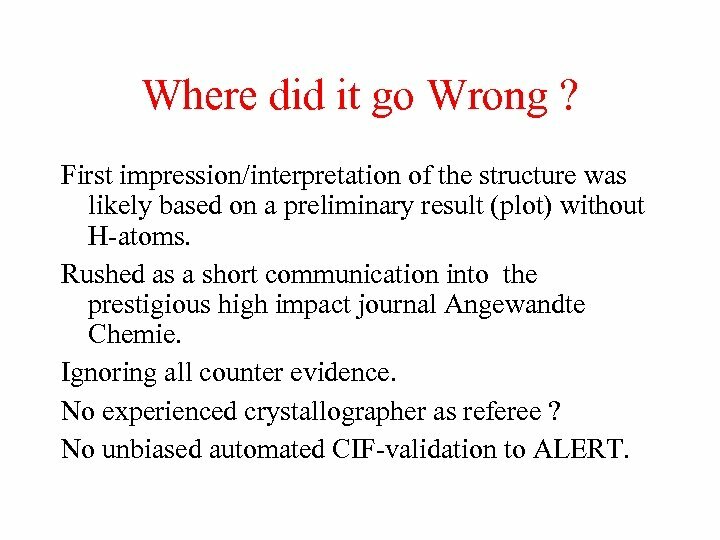 No experienced crystallographer as referee ? 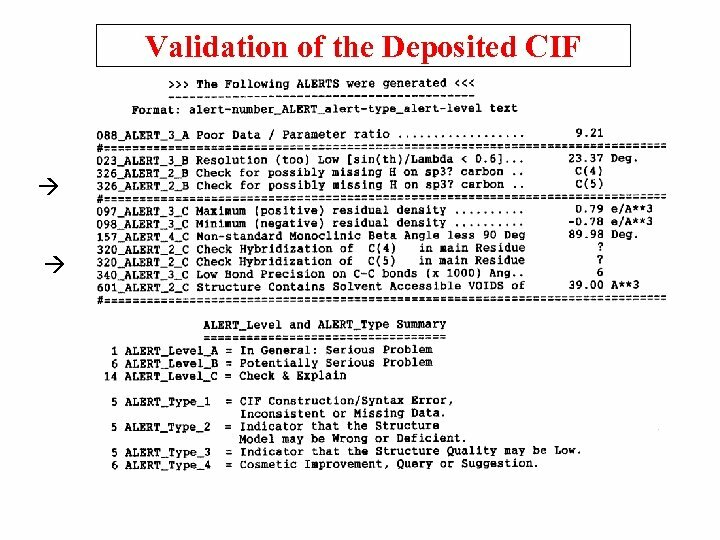 No unbiased automated CIF-validation to ALERT. 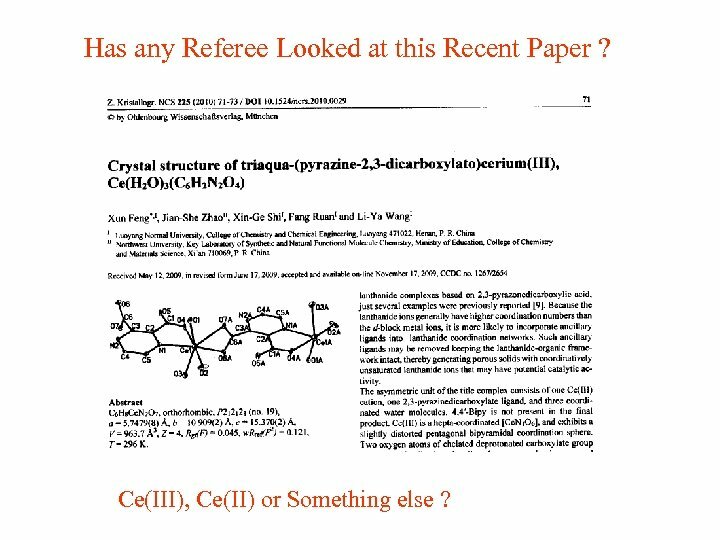 Has any Referee Looked at this Recent Paper ? Ce(III), Ce(II) or Something else ? 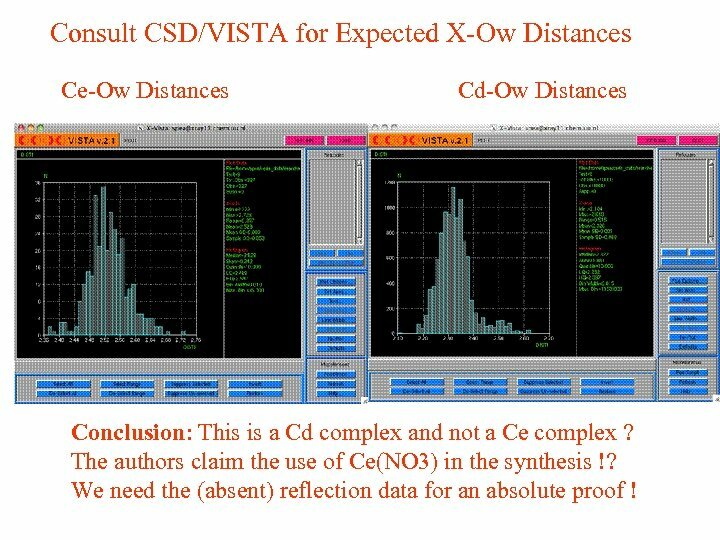 Consult CSD/VISTA for Expected X-Ow Distances Ce-Ow Distances Cd-Ow Distances Conclusion: This is a Cd complex and not a Ce complex ? 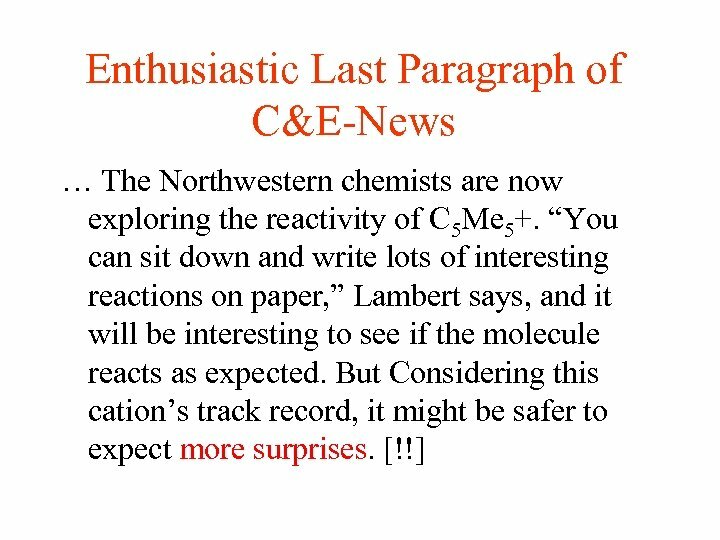 The authors claim the use of Ce(NO 3) in the synthesis !? 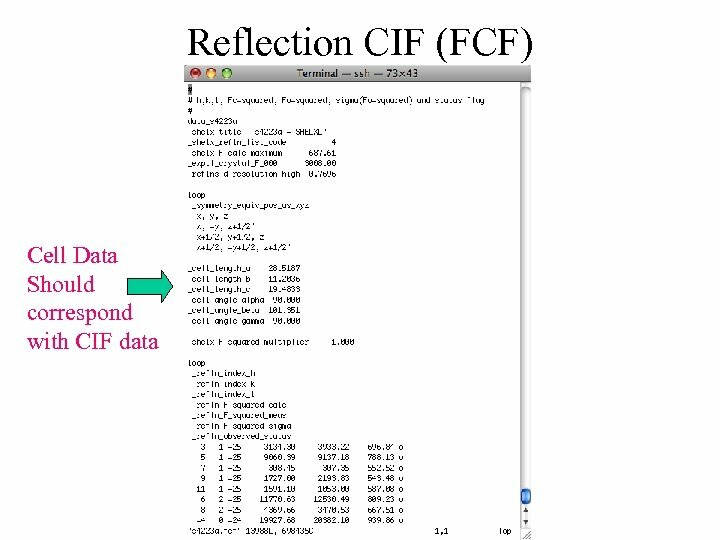 We need the (absent) reflection data for an absolute proof ! 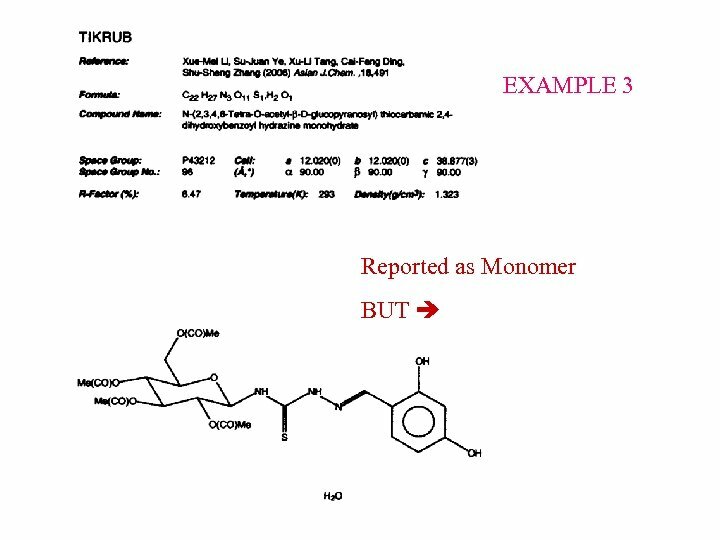 Three Examples of Erroneous entries archived in the CSD • The CSD is a rich source of chemical information. 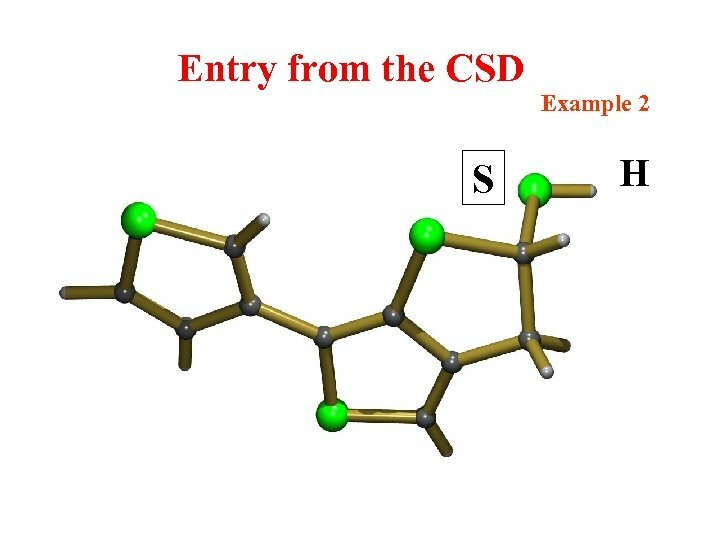 • However: An analysis of the > 500000 structures in the CSD learns that a not insignificant number of the entries has undetected serious errors. 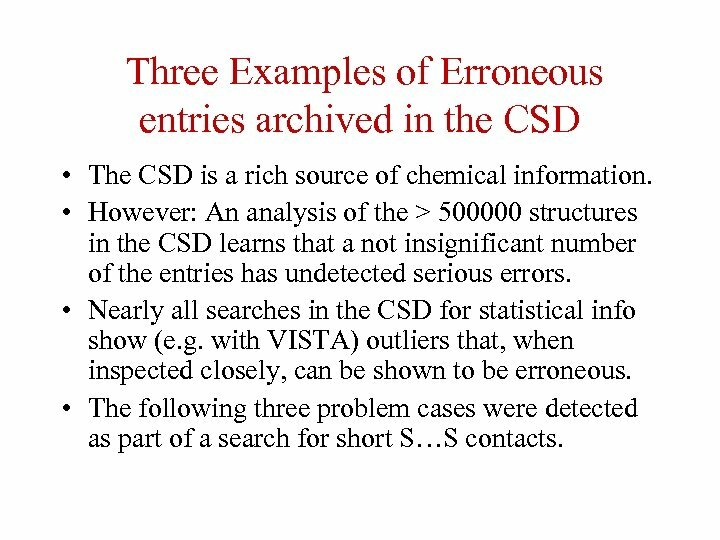 • Nearly all searches in the CSD for statistical info show (e. g. with VISTA) outliers that, when inspected closely, can be shown to be erroneous. 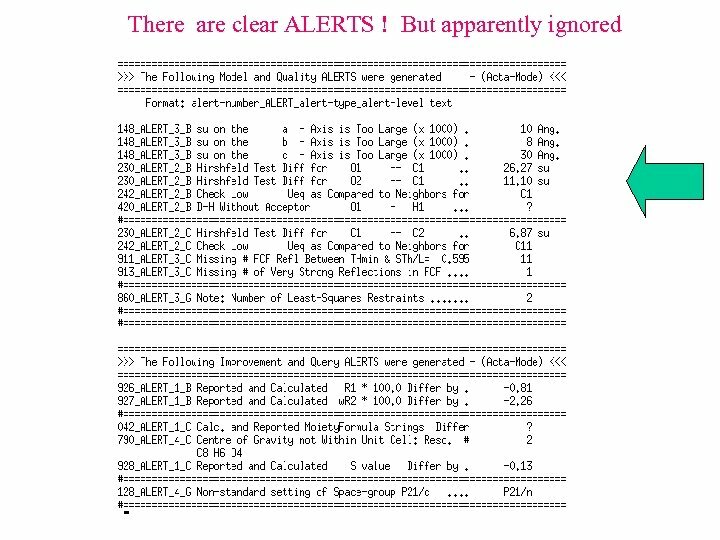 • The following three problem cases were detected as part of a search for short S…S contacts. 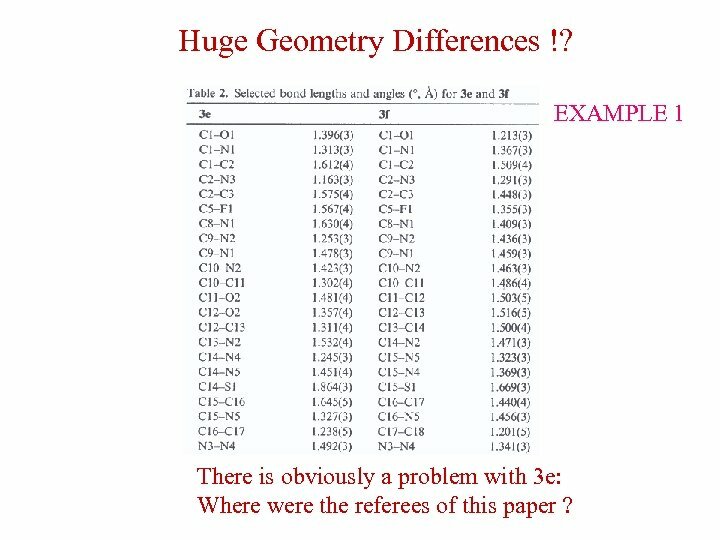 Huge Geometry Differences !? EXAMPLE 1 There is obviously a problem with 3 e: Where were the referees of this paper ? 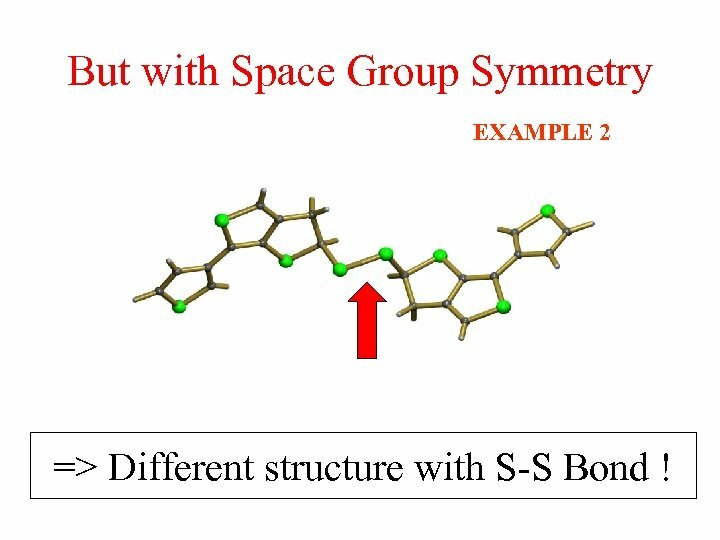 But with Space Group Symmetry EXAMPLE 2 => Different structure with S-S Bond ! 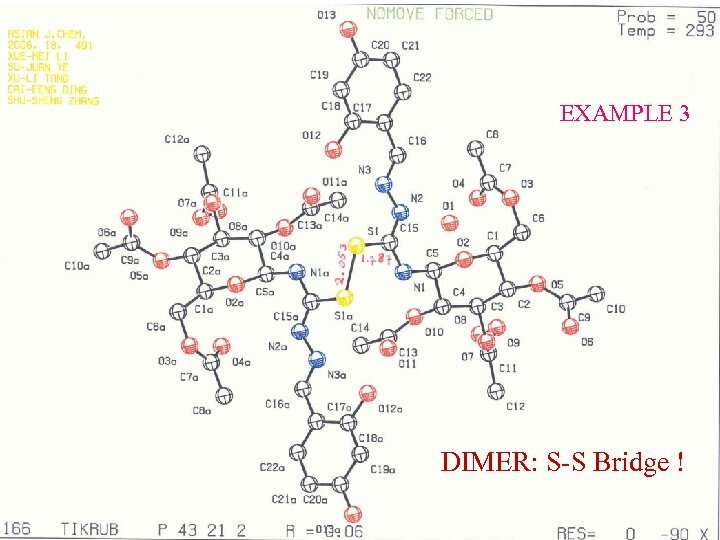 EXAMPLE 3 DIMER: S-S Bridge ! 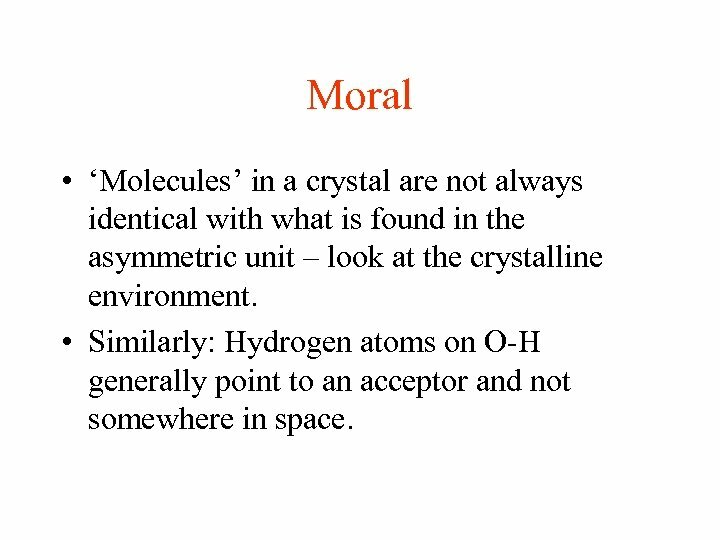 Moral • ‘Molecules’ in a crystal are not always identical with what is found in the asymmetric unit – look at the crystalline environment. 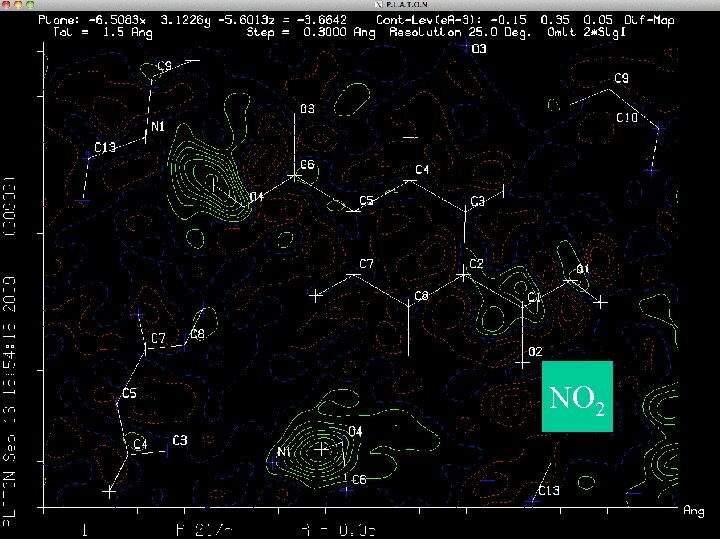 • Similarly: Hydrogen atoms on O-H generally point to an acceptor and not somewhere in space. 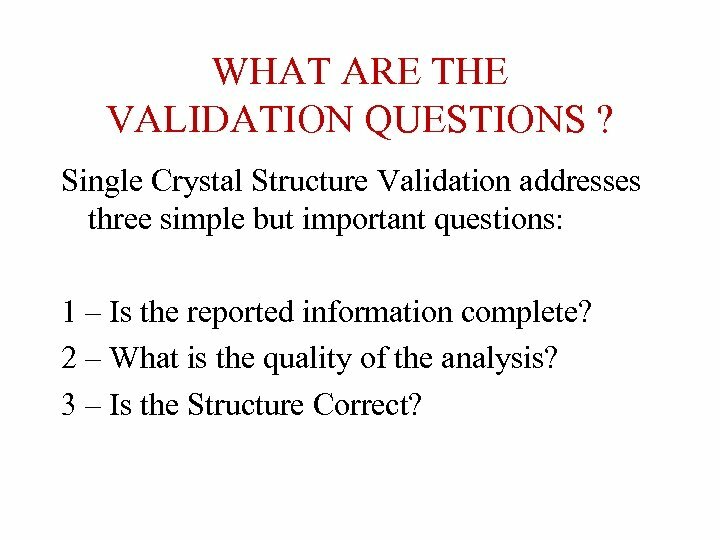 WHAT ARE THE VALIDATION QUESTIONS ? 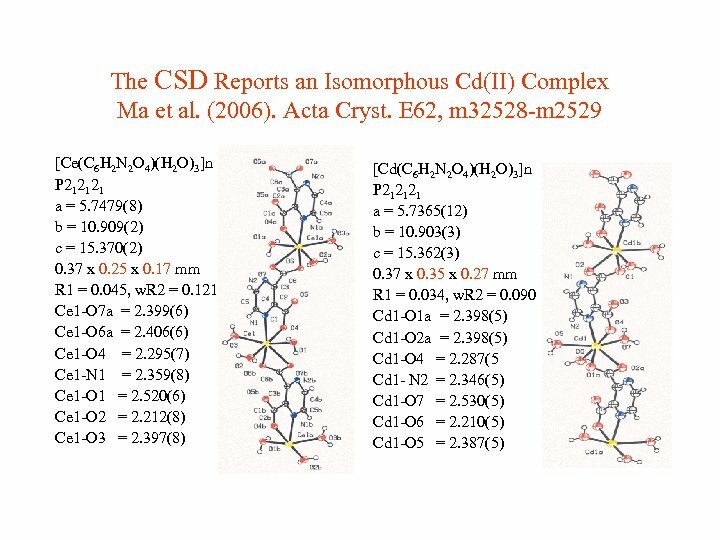 Single Crystal Structure Validation addresses three simple but important questions: 1 – Is the reported information complete? 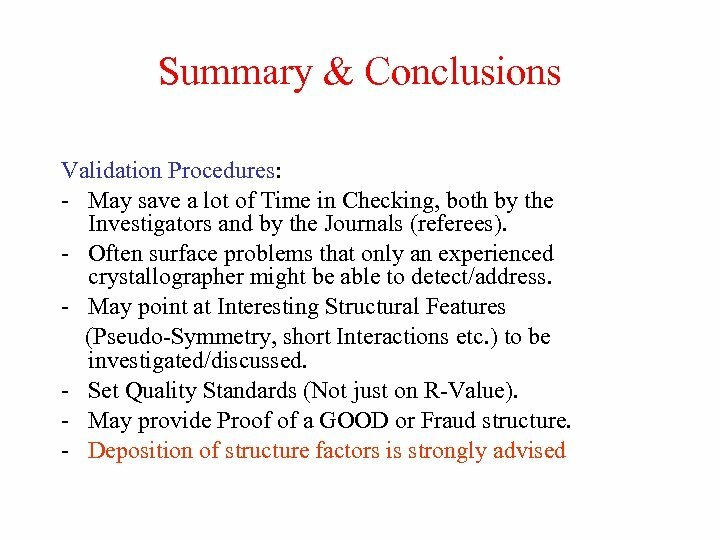 2 – What is the quality of the analysis? 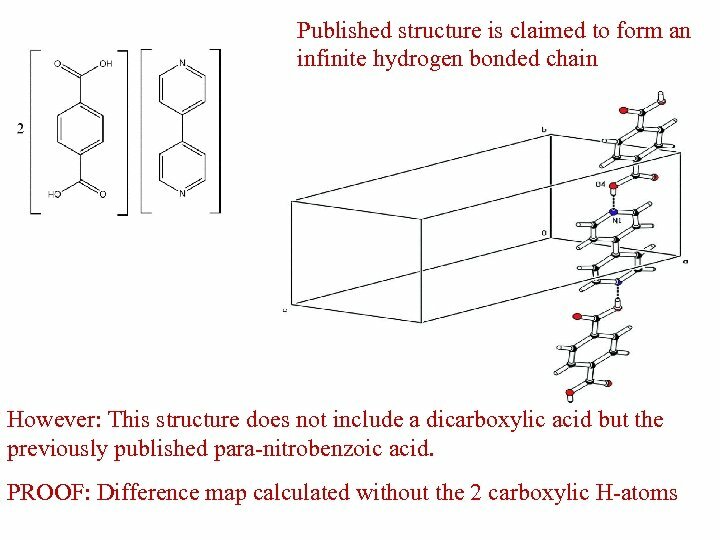 3 – Is the Structure Correct? 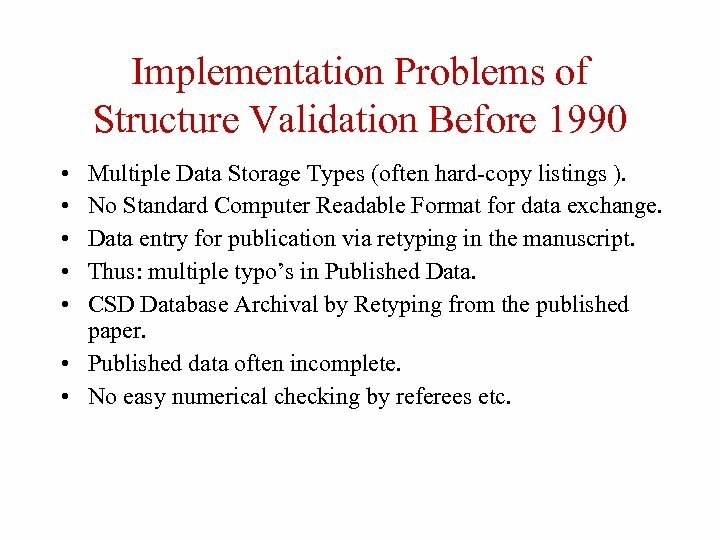 Implementation Problems of Structure Validation Before 1990 • • • Multiple Data Storage Types (often hard-copy listings ). No Standard Computer Readable Format for data exchange. Data entry for publication via retyping in the manuscript. Thus: multiple typo’s in Published Data. 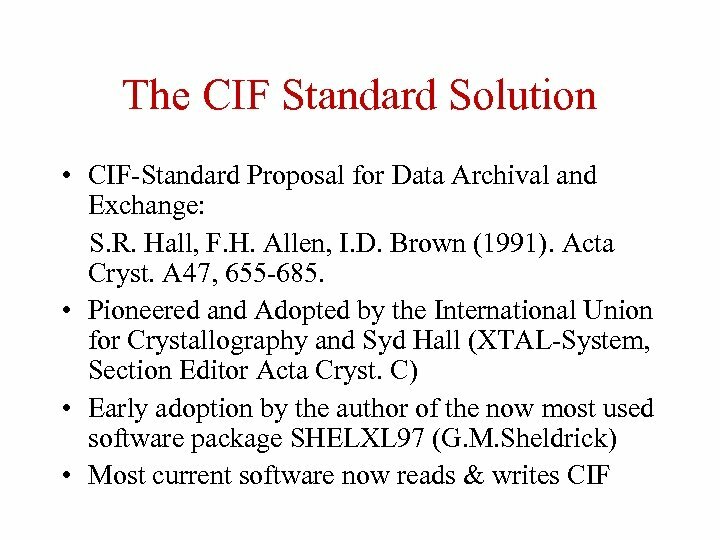 CSD Database Archival by Retyping from the published paper. • Published data often incomplete. • No easy numerical checking by referees etc. 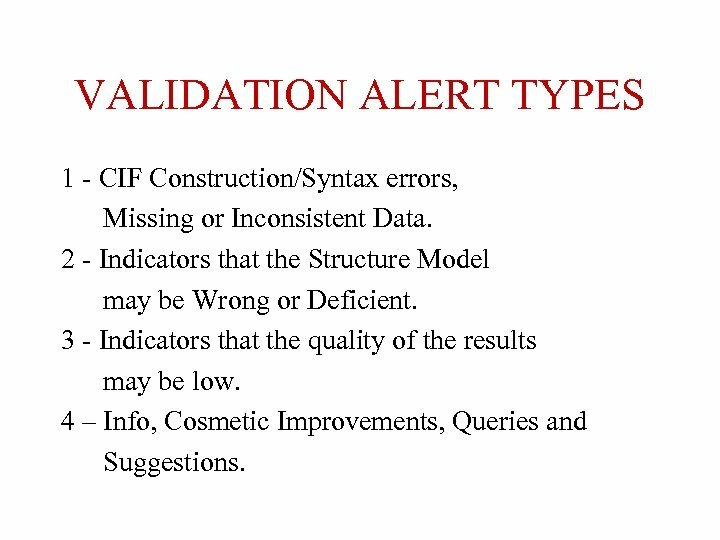 VALIDATION ALERT TYPES 1 - CIF Construction/Syntax errors, Missing or Inconsistent Data. 2 - Indicators that the Structure Model may be Wrong or Deficient. 3 - Indicators that the quality of the results may be low. 4 – Info, Cosmetic Improvements, Queries and Suggestions. 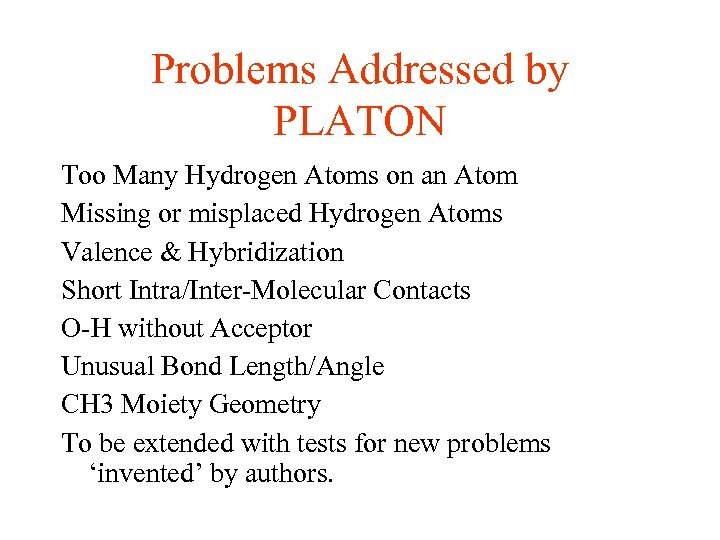 Problems Addressed by PLATON Too Many Hydrogen Atoms on an Atom Missing or misplaced Hydrogen Atoms Valence & Hybridization Short Intra/Inter-Molecular Contacts O-H without Acceptor Unusual Bond Length/Angle CH 3 Moiety Geometry To be extended with tests for new problems ‘invented’ by authors. 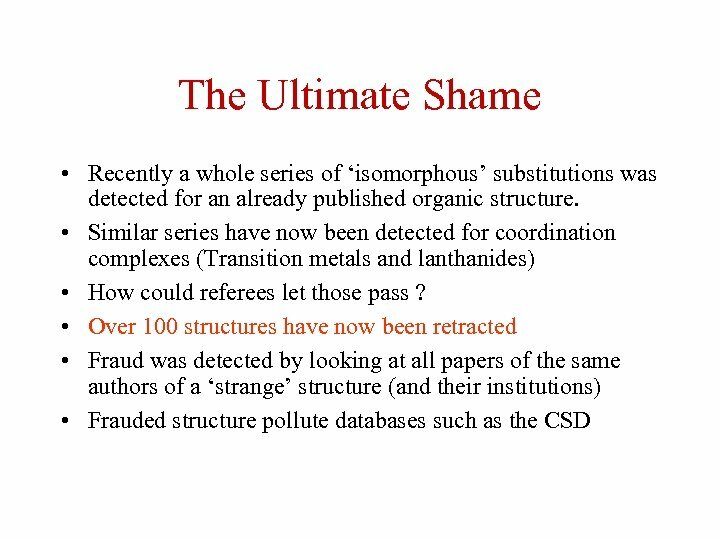 Simple Validation Issues • Many data sets are apparently collected at either 293(2) or 273 K • Improper program defaults or values from previous papers are retained (e. g. sealed tube in combination with synchrotron data) • Data collected with a CCD system and corrected for absorption with Psi-scans ! ? 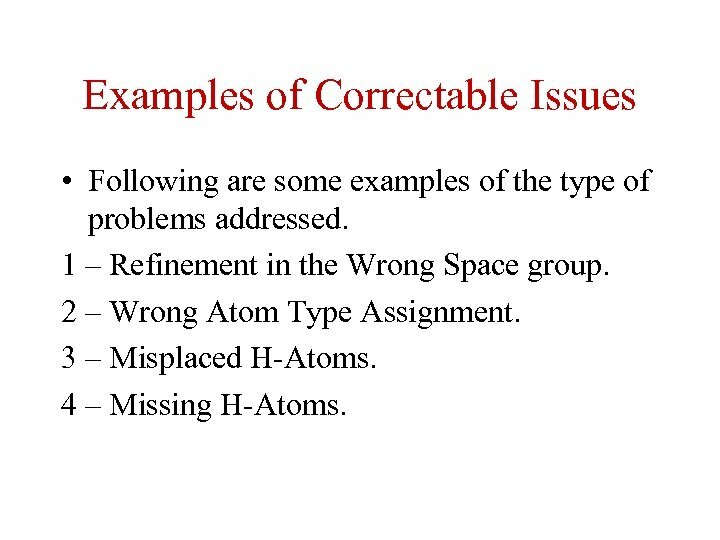 Examples of Correctable Issues • Following are some examples of the type of problems addressed. 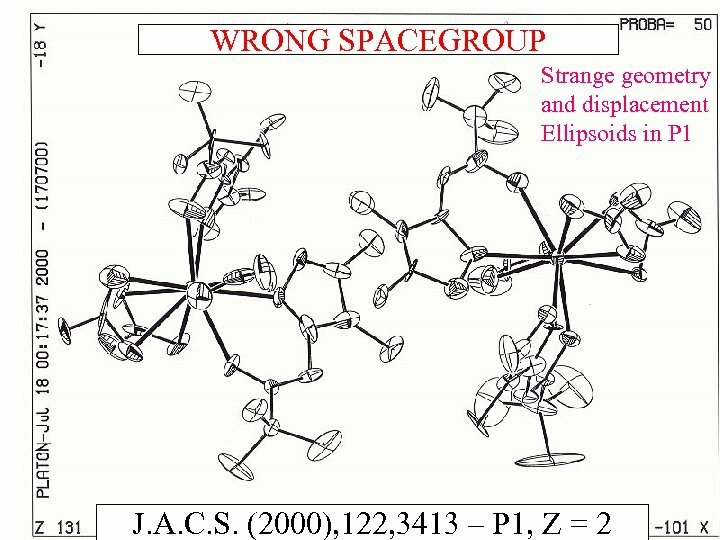 1 – Refinement in the Wrong Space group. 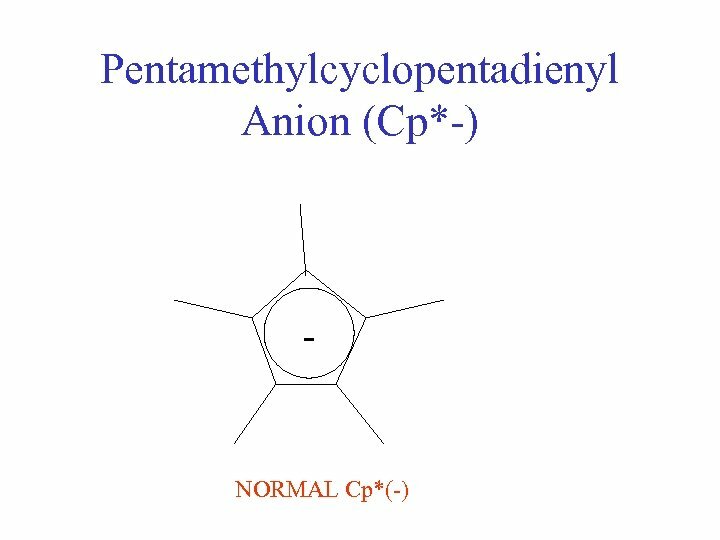 2 – Wrong Atom Type Assignment. 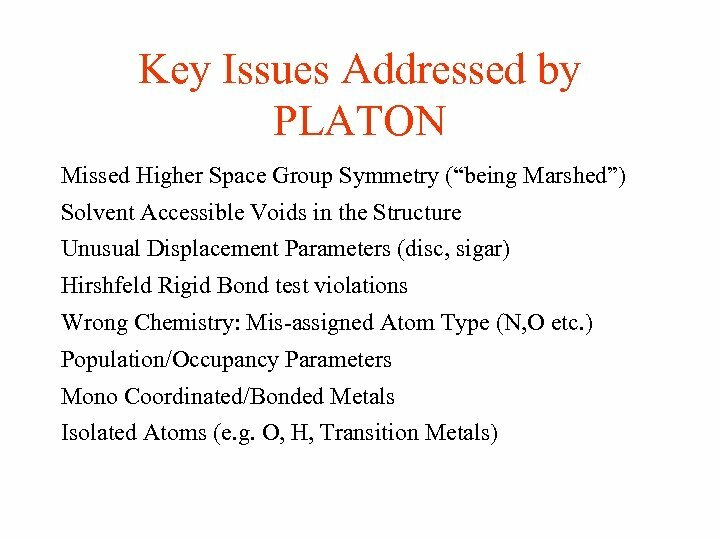 3 – Misplaced H-Atoms. 4 – Missing H-Atoms. 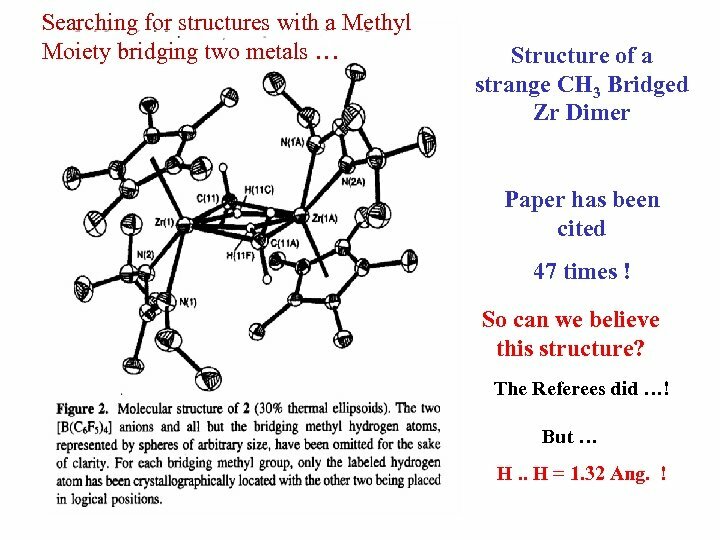 Searching for structures with a Methyl Moiety bridging two metals … Structure of a strange CH 3 Bridged Zr Dimer Paper has been cited 47 times ! 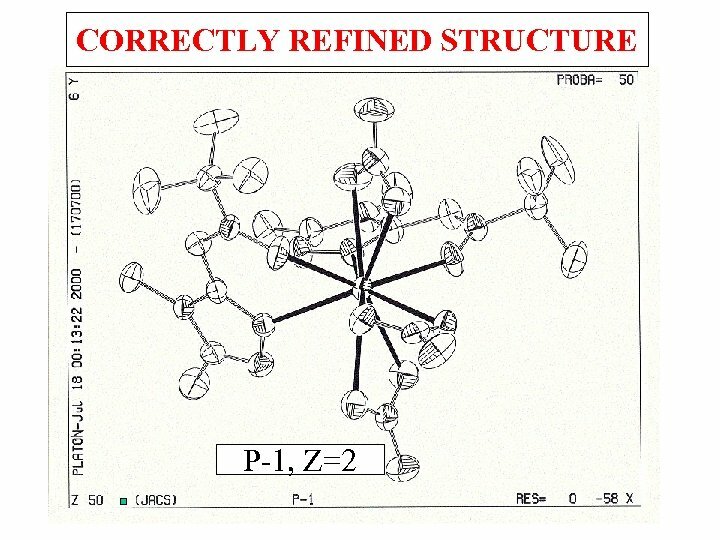 So can we believe this structure? The Referees did …! But … H. . H = 1. 32 Ang. ! 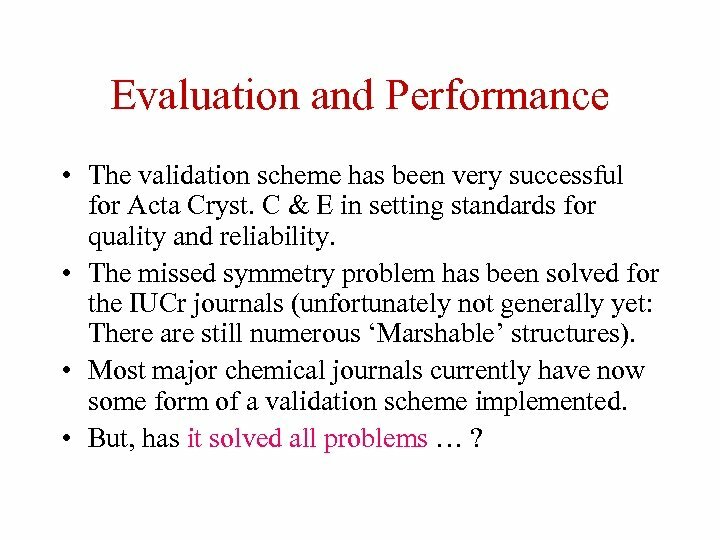 Evaluation and Performance • The validation scheme has been very successful for Acta Cryst. C & E in setting standards for quality and reliability. 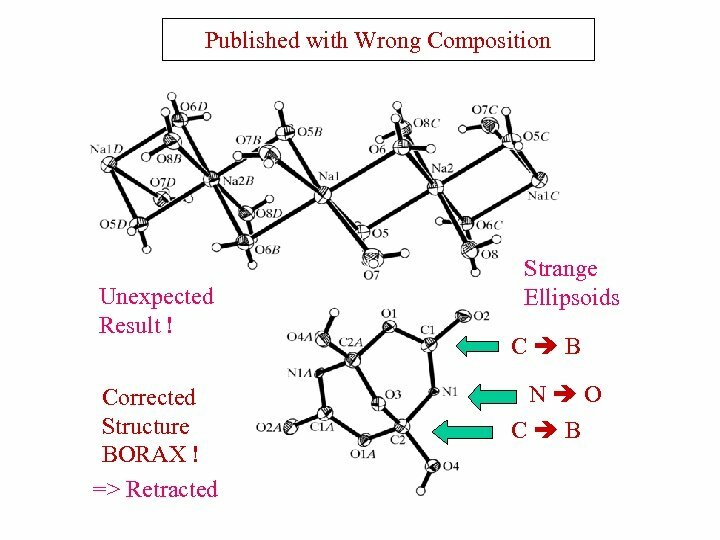 • The missed symmetry problem has been solved for the IUCr journals (unfortunately not generally yet: There are still numerous ‘Marshable’ structures). 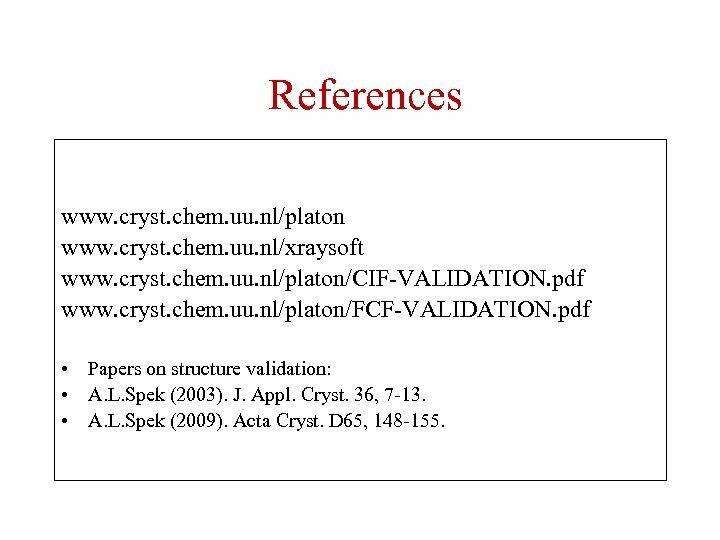 • Most major chemical journals currently have now some form of a validation scheme implemented. • But, has it solved all problems … ? 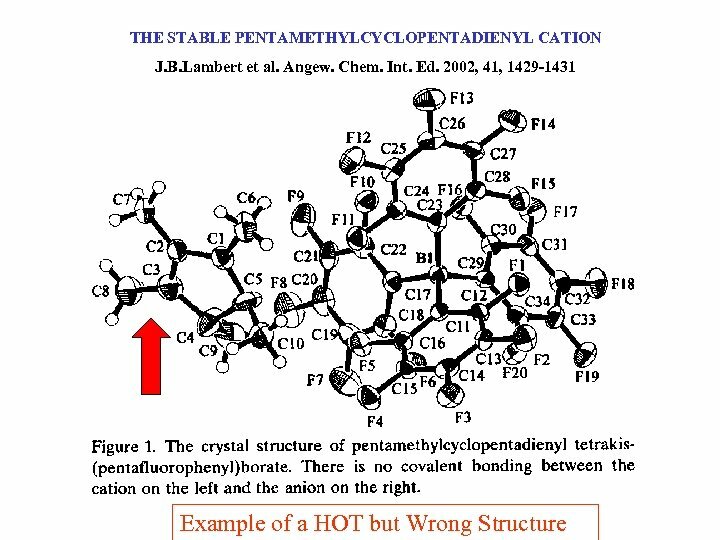 Problems to be Addressed • Synthetic Chemist View: ‘Addressing Crystallographic Details holds up the Publication of Important Chemistry’ (but see previous example in Angew. Chemie !) 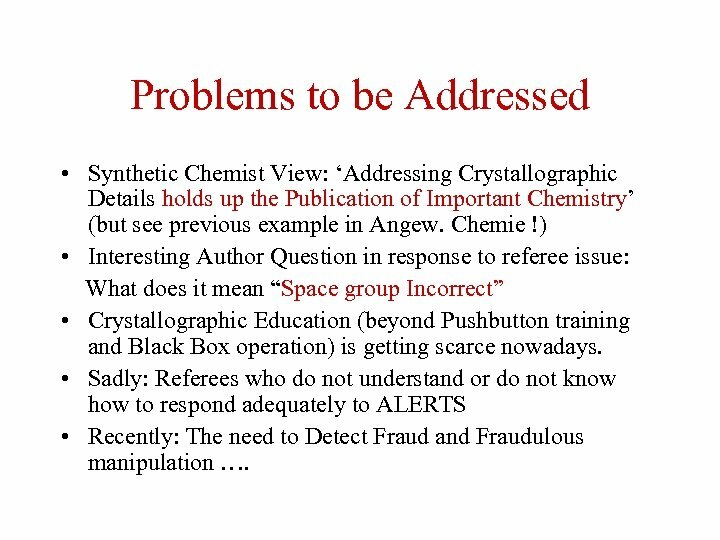 • Interesting Author Question in response to referee issue: What does it mean “Space group Incorrect” • Crystallographic Education (beyond Pushbutton training and Black Box operation) is getting scarce nowadays. • Sadly: Referees who do not understand or do not know how to respond adequately to ALERTS • Recently: The need to Detect Fraud and Fraudulous manipulation …. 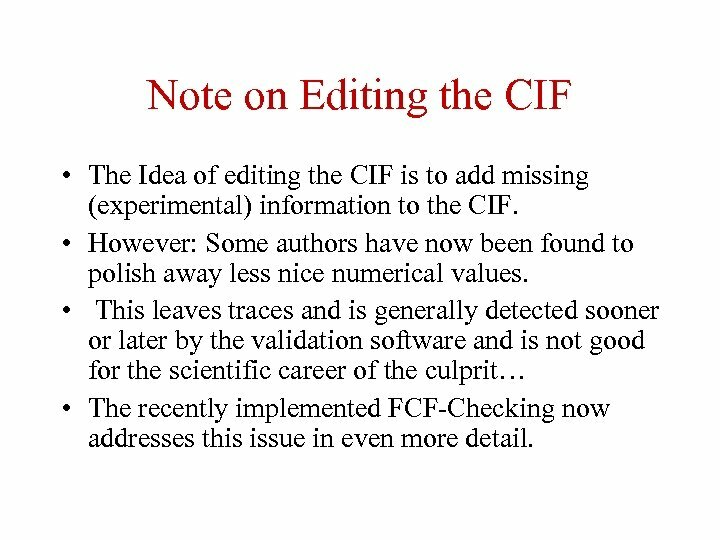 Note on Editing the CIF • The Idea of editing the CIF is to add missing (experimental) information to the CIF. • However: Some authors have now been found to polish away less nice numerical values. 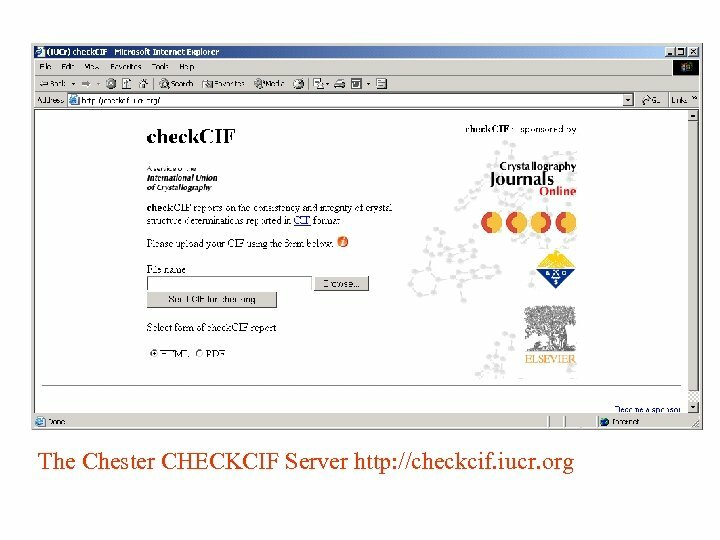 • This leaves traces and is generally detected sooner or later by the validation software and is not good for the scientific career of the culprit… • The recently implemented FCF-Checking now addresses this issue in even more detail. 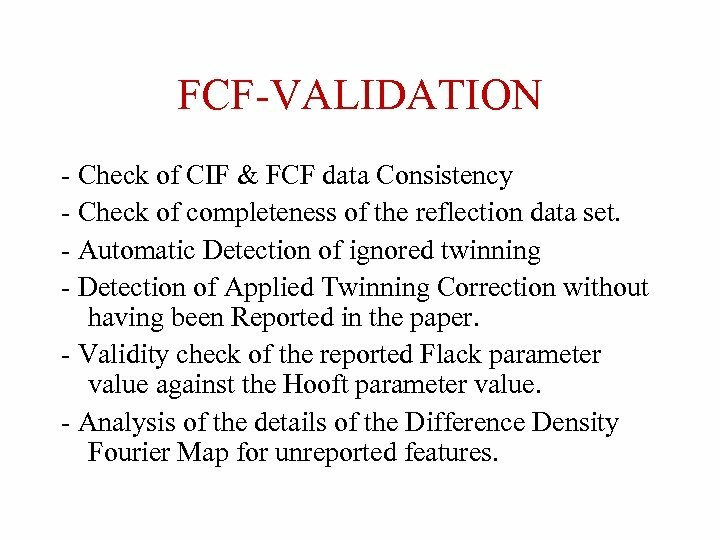 FCF-VALIDATION - Check of CIF & FCF data Consistency - Check of completeness of the reflection data set. 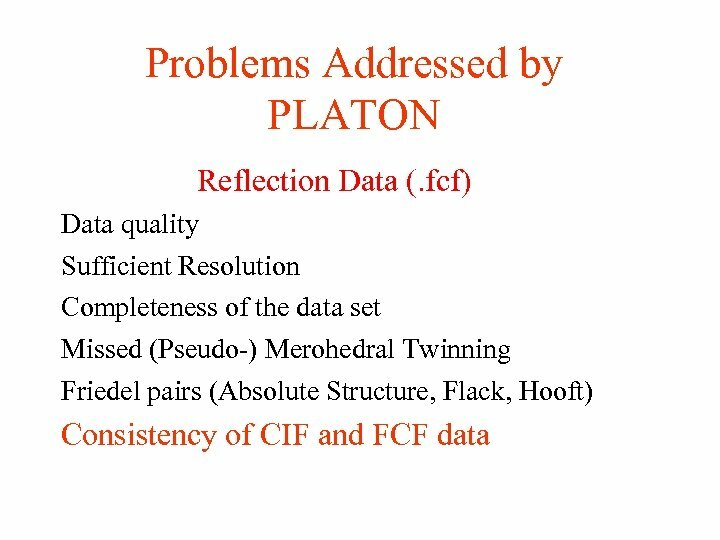 - Automatic Detection of ignored twinning - Detection of Applied Twinning Correction without having been Reported in the paper. 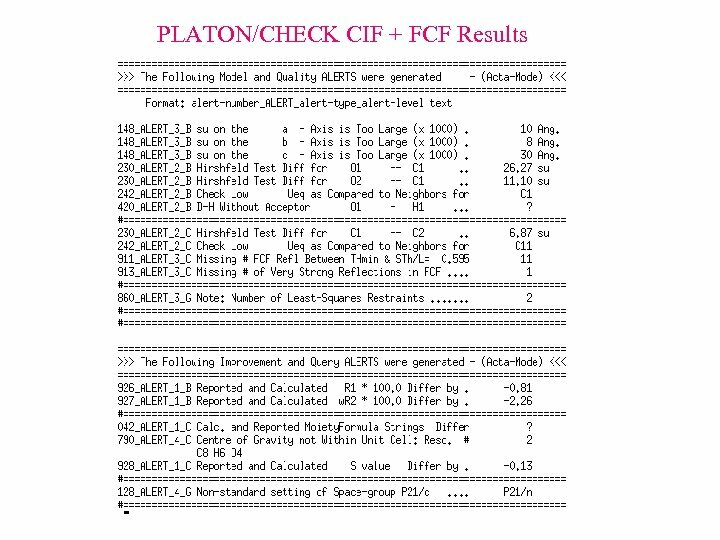 - Validity check of the reported Flack parameter value against the Hooft parameter value. - Analysis of the details of the Difference Density Fourier Map for unreported features. Sloppy, Novice or Fraudulent ? 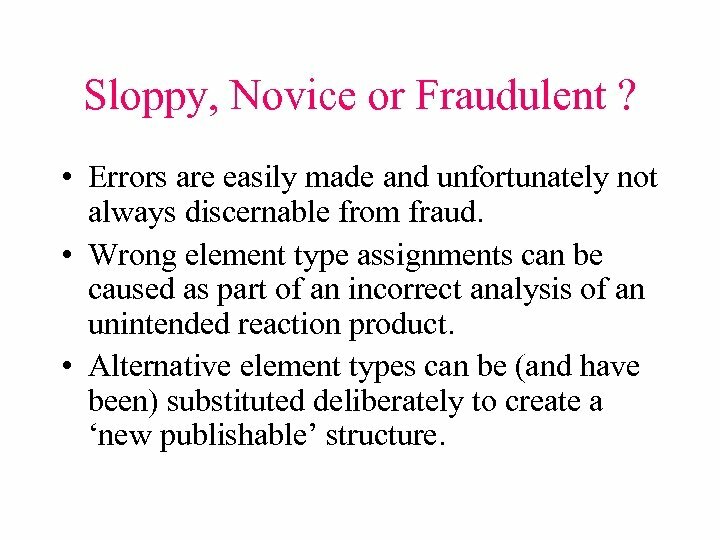 • Errors are easily made and unfortunately not always discernable from fraud. 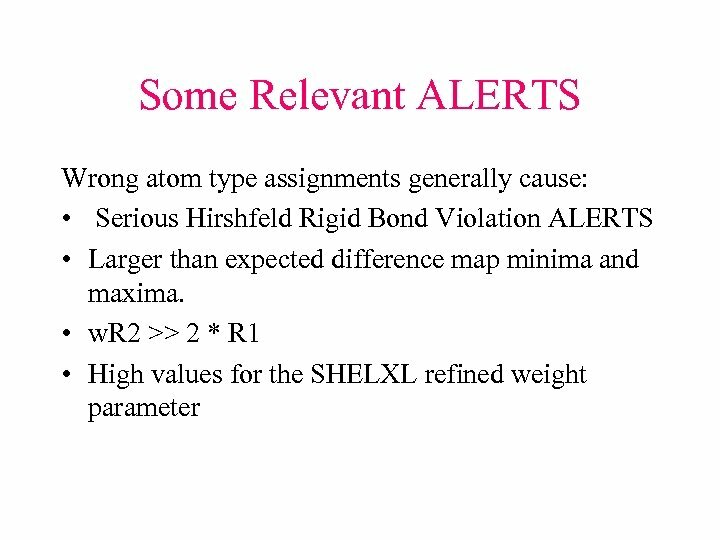 • Wrong element type assignments can be caused as part of an incorrect analysis of an unintended reaction product. • Alternative element types can be (and have been) substituted deliberately to create a ‘new publishable’ structure. 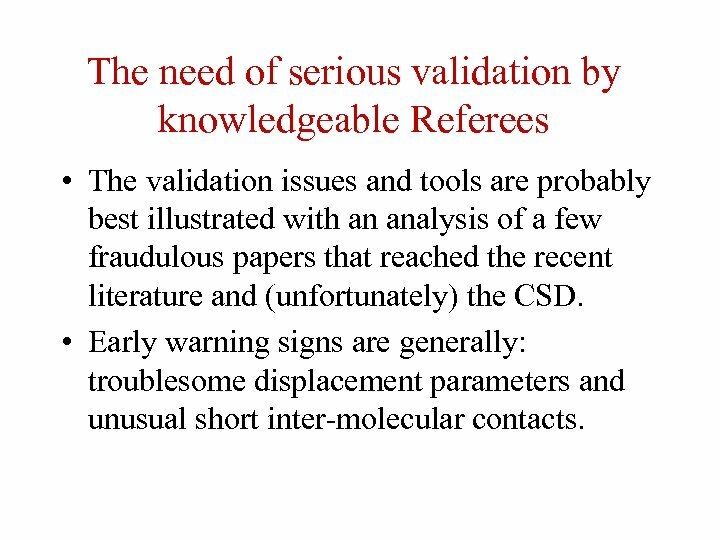 The need of serious validation by knowledgeable Referees • The validation issues and tools are probably best illustrated with an analysis of a few fraudulous papers that reached the recent literature and (unfortunately) the CSD. 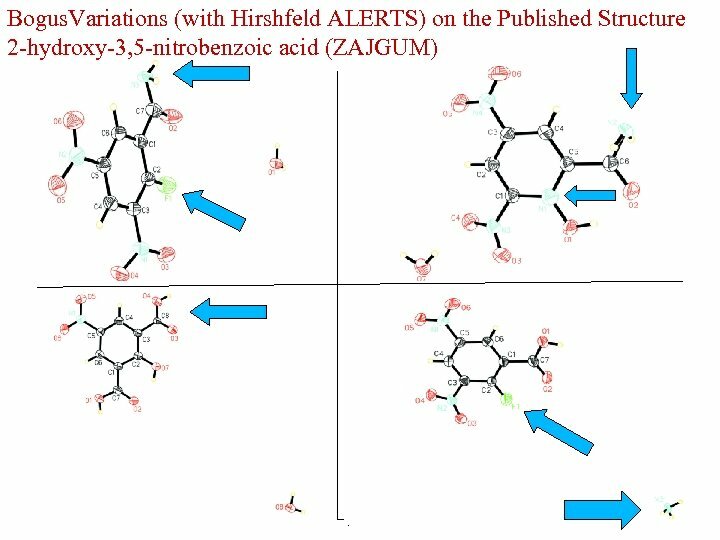 • Early warning signs are generally: troublesome displacement parameters and unusual short inter-molecular contacts. 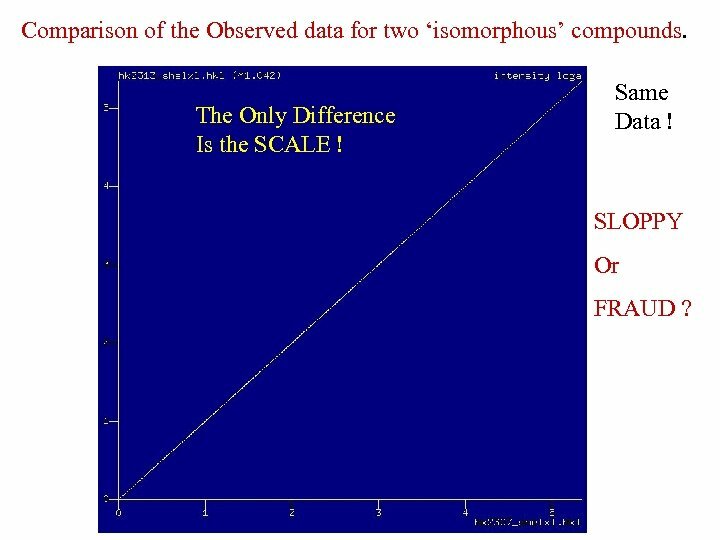 Comparison of the Observed data for two ‘isomorphous’ compounds. The Only Difference Is the SCALE ! Same Data ! 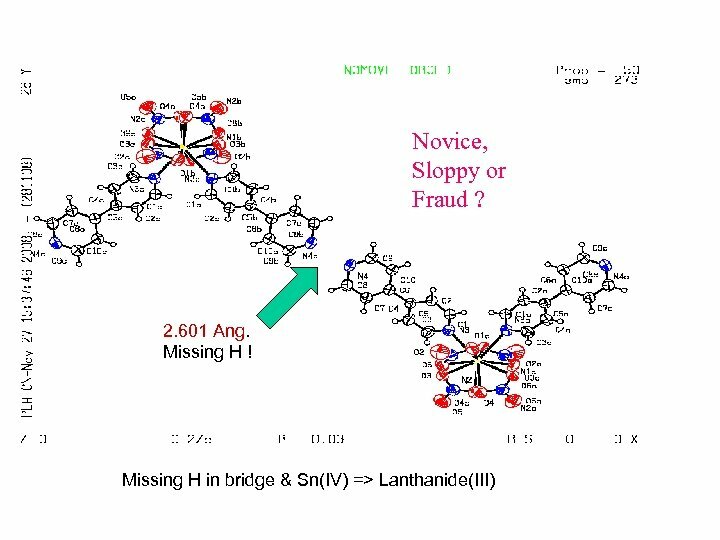 SLOPPY Or FRAUD ? References www. cryst. chem. uu. nl/platon www. cryst. chem. uu. nl/xraysoft www. cryst. chem. uu. 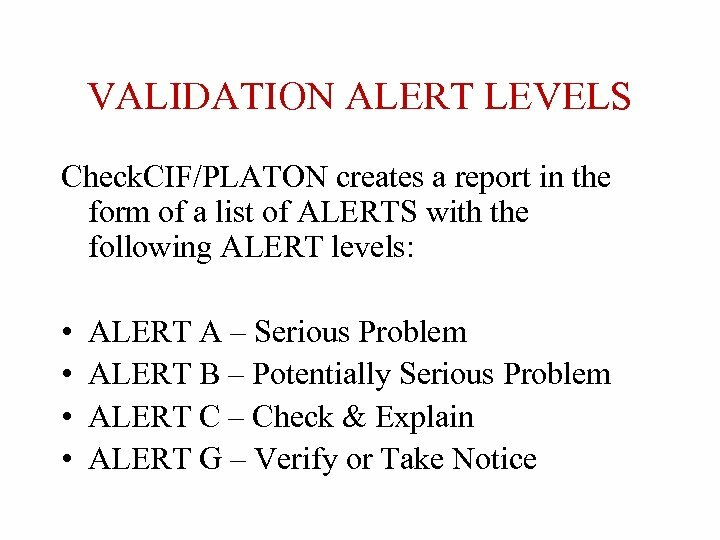 nl/platon/CIF-VALIDATION. pdf www. cryst. chem. uu. nl/platon/FCF-VALIDATION. 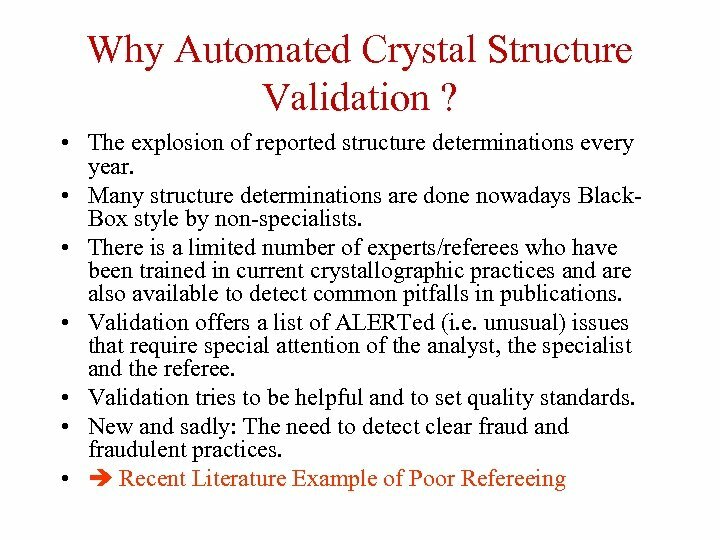 pdf • Papers on structure validation: • A. L. Spek (2003). J. Appl. Cryst. 36, 7 -13. • A. L. Spek (2009). Acta Cryst. D 65, 148 -155.